There is a risk of injuries, poisoning, chemical burns, explosions or fire when carrying out any work on the battery and on the electrical system. It is essential to comply with the generally applicable rules of safety as well as the warning instructions outlined below. Keep the vehicle battery away from people who are not completely independent, especially children. Do not tilt the battery otherwise battery electrolyte may flow out of the battery vent openings. Protect your eyes by wearing safety glasses or a face shield – there is a risk of being blinded. Always wear protective gloves, eye and skin protection when handling the vehicle battery. The battery acid is strongly corrosive and must, therefore, be handled with the greatest of care. Corrosive fumes in the air irritate the air passages and lead to conjunctivitis and inflammation of the air passages in the lungs. Battery acid corrodes dental enamel and creates deep wounds on contact with the skin which take a long time to heal. Repeated contact with diluted acids causes skin diseases (inflammations, ulcers, slin cracks). If any battery electrolyte comes into contact with your eyes, rinse the eyes immediately with clear water for several minutes - consult a doctor immediately. Splashes of acid on your skin or clothes should be neutralised as soon as possible using soap suds and then rinsed with plenty of water. Seek immediate medical assistance if you swallow battery acid. It is prohibited to work with a naked flame and light. Smoking or any activities which produce sparks are prohibited. Never use a damaged vehicle battery – there is a risk of explosion. Replace a frozen vehicle battery. When you charge a battery, hydrogen is released, and a highly explosive gas mixture is also produced. An explosion can be caused through sparkling over during unclamping or loosening of the cable plug while the ignition is on. Bridging the poles on the battery (e.g. with a metal object, cable) creates a short circuit - there is a risk of melting the lead terminals, explosion, the battery burning, of acid being ejected. Avoid creating sparks when working with cables and electrical devices. Strong sparking represents a risk of injury. Before carrying out any work on the electrical system, switch off the engine, the ignition and all electrical components and disconnect the negative terminal (-) on the battery. Improper handling of the battery can lead to damage occurring. We recommend having all work on the vehicle battery be undertaken by a specialist garage. The vehicle battery must only be disconnected if the ignition is switched off, otherwise the vehicle's electrical system (electronic components) can be damaged. When disconnecting the battery from the electrical system, first of all disconnect the negative terminal (-) of the battery, followed by the positive terminal (+). When connecting the battery to the electrical system, first of all connect the positive terminal (+) of the battery, followed by the negative terminal (-). Under no circumstances must the battery cables be connected incorrectly – risk of a cable fire. Ensure that battery acid does not come into contact with the bodywork – there is a risk of damage to the paintwork. Do not place the battery in direct daylight in order to protect the vehicle battery housing from the effects of ultra-violet light. If the vehicle has not been driven for more than 3 to 4 weeks, the battery will discharge. This is because certain electrical components consume electricity (e. g. control units) also in idle state. Prevent the battery from discharging by disconnecting the battery's negative terminal (-) or continuously charging the battery with a very low charging current. If the vehicle is frequently used for making short trips, the vehicle battery will not have time to charge up sufficiently and may discharge. A vehicle battery that has been removed is a special type of hazardous waste. These must be disposed of in accordance with national legal regulations. You should replace batteries older than 5 years. 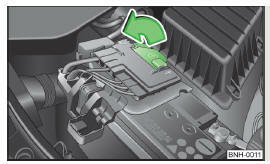 The battery is located in the engine compartment below a plastic box » Fig. 131. Open the cover in the direction of the arrow » Fig. 131. The installation of the battery cover on the positive terminal side takes place in the reverse order.